Thinking about adopting a GSP? If you are considering adopting your first German Shorthaired Pointer, be forewarned – this is not the breed for just any family! GSPs are highly energetic, athletic and intelligent dogs. They can also be wonderful companions, cuddlers and bed hogs, but only if their exercise needs (both physical and mental) are met. If those needs are not met, unwanted (often destructive) behaviors are usually the result. Because of their overabundance of energy, these dogs make great running or jogging partners. 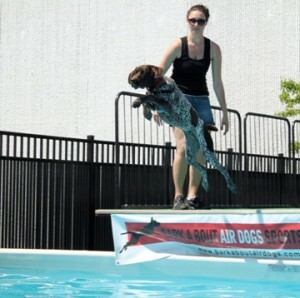 They also excel at activities such as hunting, dock-diving, agility, fly ball, swimming, and trail hiking, just to name a few. Remember, a tired shorthair is a happy shorthair. If you would prefer a lower energy dog that does not require as much daily physical exercise, maybe an older GSP is the right one for you. Because the GSP’s average lifespan is 12-15 years, a more moderate or mellow 7 year old might just be your perfect match. Color: Color can range from solid liver to a bright white body with a liver head. There are also rare few black and white or black and white ticked GSP’s. Most of these are German imports, as the color is not yet accepted as a part of the AKC breed standard. Pattern: Shorthairs may have blazes or may have solid liver heads, they can be ticked (small flecking with white background), ticked with large patches, or roan (such fine ticking they appear almost solid colored). Size: Females can range from as small as 35 lbs. to as large as 70 lbs. depending on height and condition. Males may range from 45 lbs. to more than 90 lbs.– though such extremes are less usual.